Merry Christmas and Happy New Year from the Compline Underground! I began writing this blog in January 2011. To mark its first anniversary, I will look back over the past year’s entries and mention several of my personal favorites, and adopt a resolution for 2012. But first, I’d like to give some highlights of the Advent season and last Sunday’s Compline Service from Seattle on Christmas Day. O Emmanuel, our King and Law-Giver, the desire of the nations and their salvation : come and save us, O Lord our God! The Compline services from three of the four Sundays of Advent, and Christmas Day, are now available on the choir’s podcast site, complinepodcast.org. Of the many wonderful Advent psalms, hymns, and anthems sung, one of my favorites is Peter Hallock’s setting inspired by the chant “Rorate caeli”. You can hear it on the podcast from December 4, 2011, beginning at about 22:30. I particularly like the ending, where the solo countertenor sings “Confortamini” (be comforted), making a dissonance with the chord held by the choir — a very mystical sound and typical of much of Hallock’s music (musicians will recognize it as the “Lydian Mode”). Drop down dews, ye heavens from above, and let the clouds rain the Just One. Be not angry, O Lord, and remember no longer our iniquity. Behold, the city of thy sanctuary has become a desert; Zion is made a desert, Jerusalem is desolate. Be comforted, be comforted my people; why hast sorrow seized thee? Fear not, I will save you, For I am the Lord thy God. This wonderful anthem was also sung by the Trinity Compline Choir, from Holy Trinity Church, Nevada City, California. 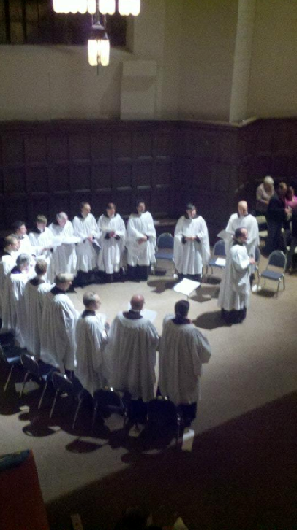 Listen to their Advent service from a link on their home page at http://trinitycomplinechoir.org/. The Christmas Day Compline service from St. Mark’s Cathedral last Sunday began with Hallock’s arrangement of “Away in a Manger” for unison voices and organ, and ended with a setting, also for unison voices and organ, of “O Magnum Mysterium” by Gerald Near, who is currently Choral Director and Cantor at Holy Faith Episcopal Church, Santa Fe, New Mexico. My first-year blog started out as almost a weekly missive, with four postings in the months of January and February, then tapering down to one per month in July through December. I’ve always tried to aim more for quality than quantity, but certain blogs stand out for me, particulary “Post-Compline Organ Music” and “Psalm 91 and a Movie”. I should mention that the latter of these two speaks of Compline Choir’s participation in the movie Nothing Against Life — the movie has yet to be released, but I hope to see it released in 2012. I’m also partial to the second posting on the ancient hymn “Phos Hilaron” and the tribute to Ralph Carskadden. I have an idea about Compline Underground in 2012: I want to feature, each week, a different group across North America that is praying Compline. There are at least 50 different groups, outside of monasteries, that I know about and have listed on the Seattle Compline Choir “other links” web page. So here’s to a blog a week in 2012!